Since its humble beginnings Oysterfest has become the most anticipated culinary festival of the summer… one that is difficult to avoid as it started a few hundred feet from BandMark’s backyard! And it’s no surprise the festival keeps evolving into a bigger and better event every year. Founder Daniel Notkin lives and breaths oysters, throws world class events while promoting ocean sustainability and aquatic-life awareness (Open Pier Conservatory, a non-profit group). The two-day event is a celebration of food, where 25,000+ oysters are expected to be devoured. Oysterfest 2015? A hedonistic oyster playground of guests, restaurants, vendors, oyster shucking competitions, drink-making competitions, a master chef plating competition, local bands, a beer boat race, a slip-and-slide sponsored by K-Way and a rocking fireworks display! So You Think You Can Drink, a boozy competition called “So You Think You Can Drink” where amateur bartenders pair up with professional mixologists to create a signature cocktail. The Montréal Oyster Shucking preliminary rounds, one of the most renowned oyster shucking competitions in Canada. Amateur and professional divisions, shuckers from all over North America and Europe will compete in single-elimination knockout rounds to bid for the ultimate title on Sunday. The Montréal Chef’s Classic Plating Competition, where the cities top 5 chefs will go head-to-head to create the best jaw-dropping seafood plate. Platters are then auctioned off, with the proceeds going to the winning chef’s charity of choice. The Bishop & Bagg Professional Pro Cup, where the winner of the So You Think You Can Drink joins the premiere mixologist in a mystery-box challenge for a cash prize and bragging rights! The Walter’s Caesar Throwdown, if your a fan of the drink wait till you see what Montreal’s top bartenders have in store for you! 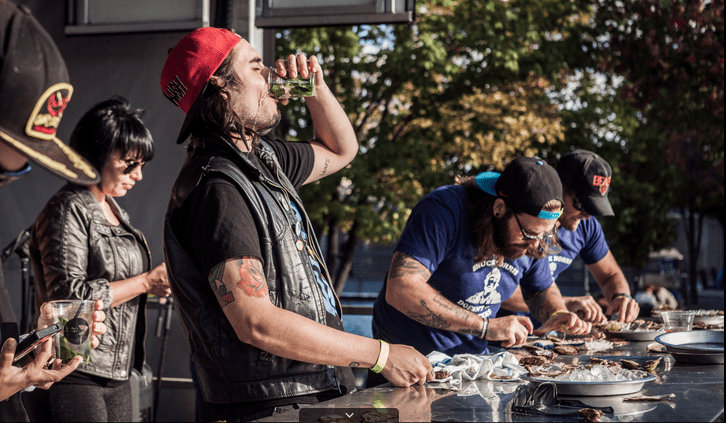 The Montréal Oyster Shucking Championship, winner takes all!